Cosworth High Performance Engine assemblies are the perfect basis for your high performance application. Each version has gone through countless hours of engineering and evaluation to determine the best combination of parts and build specification, ensuring maximum reliable performance. Each Cosworth High Performance Engine assembly starts with all new select components as the foundation of the performance build. Every block is thoroughly inspected before the cylinders are honed to perfection. We then balance the rotating assembly that includes either a new factory forged crankshaft or Cosworth Billet crank along with Cosworth Forged connecting rods, Cosworth Tri-Metal bearings and Cosworth Forged Pistons. The motorsport grade parts are then professionally assembled by expert engine builders in the Cosworth engine assembly facility. Each High Performance Engine Assembly includes a complete specification sheet listing all critical dimensions along with a serialized plaque. For maximum performance, combine with a Cosworth CNC ported Big Valve Cylinder Head and camshaft set. 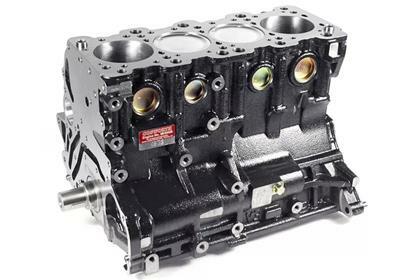 The Cosworth EJ25 is an excellent starting point for high performance and track day applications. The Cosworth 2.0L 4G63 is an excellent starting point for high performance and track day applications. The Cosworth 4G63 2.2L stroker engine combines the perfect bore to stroke ratio, yielding potentially big gains in torque while still allowing the engine to rotate and produce power at higher rpms. The Cosworth VQ35DE high performance short block is the perfect foundation for your high performance application. Available in either high compression 11:1 or low compression 8.8:1 for turbo or supercharged applications.